Last night I stayed in the Mountain View Guesthouse in Dungarvan. It does indeed have a view of a mountain, but the owner of the guest house did not know its name. Very comfortable stay, but I have to say that the nearby main street and square were very quiet. There is a Fleadh Ceol coming up this weekend - so I'm sure it will get more lively. I stopped in John Keane's Bar (Mary Street) for a pint and free WiFi - on the way back to the Guest house I stopped in another pub at about 9.30 and I was the only person there! First port of call today was the Ring Gaeltacht and Helvick Head. This gives a fantastic view over Dungarvan Bay. All signs are in Irish only here - I think they should have them bi-lingual like in the rest of the country. After Helvick Head I set out on the Coastal Route to Ard More - this is a really enjoyable route with sea views to the left and the Comeragh mountains to the right. Ard More itself is a beautiful spot - I checked out the Round Tower in a graveyard before going up to a local cliff walk. Here I met a monk from America who took my photo at the Look Out Tower. The Tower was accessible and I had a look inside - pity about all the bottles and cans thrown about. The Pat Power Puppet Band. Next I stopped off in Youghal - a lovely town. 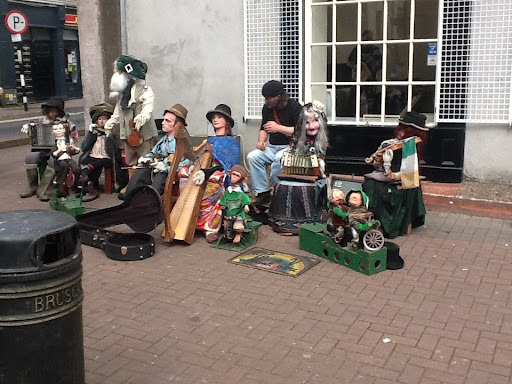 I had a coffee in Luigi's by the Clock Tower and listened to the Pat Power Puppet Band. I then went on to Ballymacoda to see Knockadoon Head which has an Island at the end. A local fisherman told me the island was called "Capal" Island after two brothers who were drowned nearby and buried there. The next part of the coast brought back a lot of memories for me from my time in school in Trabolgan. When my folks came to visit I was brought out to eat in the Garryvoe Hotel, and to visit Ballycotton. Arriving in Trabolgan, I knew that the old house (which was our school - Scoil na nOg) was demolished, but there was very little of anything left from 1972 when I attended the school. It took me a while to get my bearings, but I was lost in nostalgia that the loud music, games arcades, and fast food outlets could not diminish. I walked around the grounds as if I was back in 1972 and I was a 12 year old boy running around. 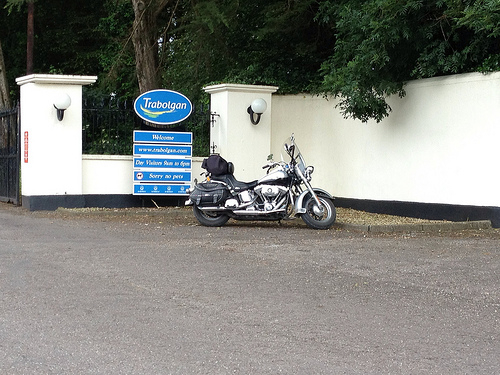 After Trabolgan I headed for Cobh - this was a quick visit, though I did ride around Great Island. Cobh is very busy, but it looks spectacular in the sun and there are flowers everywhere. Well worth a visit. Not wanting to hang around Cork city I headed for the Jack Lynch (bring him back!) Tunnel and the South Ring Road. I stopped for a late lunch in Carrigaline and enjoyed soup and sausage roll at Hassetts Cafe - delicious. This was so busy that I only stopped for a few minutes, preferring to keep going and avoid the crowds. Like in Tramore, I stopped beside the Fun Park and watched the hardy Irish have fun. Kinsale needs some time to itself, and not just a few minutes on a round Ireland trip. So far I ike West Cork and will be suggesting this as a holiday destination to herself sometime in the next few years. Our Lady admires my bike. The best (and worst) thing about Kinsale is Kinsale Head. This is a super attraction, and is easy to access, except for the last bit - non-golfers are not allowed past the imposing gates at the entrance to Old Head Golf course. Pity. I took a short detour to Ballinspittle - the village made famous by a moving statue many years ago. 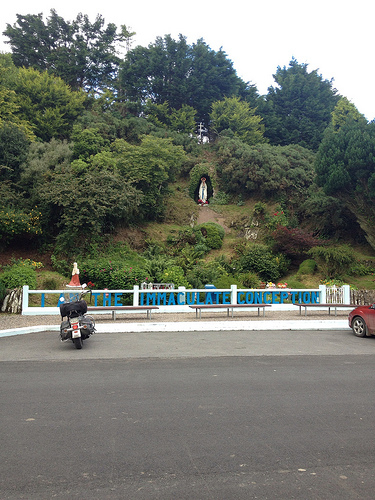 The Grotto where the statue is has plenty of room for worshippers and the curious. It was very quiet there today - I was the only one there. After a decade of the Rosary, she (the Virgin Mary) did not move, but I did...on. The last part of the day was to head for Courtmacsharry. I stayed here before back in my student days, but remember little. The approach to Courtmac is glorious - especially on a lovely evening like today. A very picturesque village - I stopped for a Murphys in the Pier Harbour bar and have just had a super fish pie in the Lifeboat Bar which is right beside my accomodation for the evening.